It isn't a new trend in Bollywood, but one would think as movies got smarter and audiences evolved, we'd see lesser of an age gap between our heroes and their young heroines. No chance. 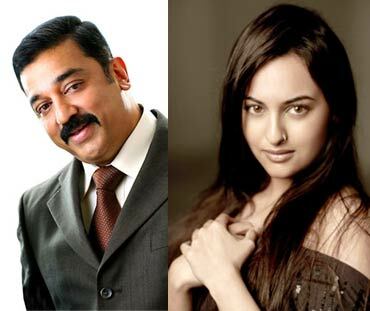 Kamal Haasan's rocking it with Sonakshi Sinha in his next, while Rajnikanth's upcoming film features him opposite Deepika Padukone. Here, then, is a look at these two actors, and other recent films with massive age gaps between the hero and heroine. At 25, Deepika Padukone is 35 years younger than Superstar Rajnikanth, not that it makes a difference to the leading man or to his audience. The girls are just filler as everything in a Rajnikanth film is about him, and especially a film like this, where he is rumoured to be playing three roles. Kamal Haasan is 56, and in his upcoming Vishwaroopam, directed by Selvaraghavan, he stars opposite Sonakshi Sinha, 23, and Shriya Saran, 28. Which means he's quite a bit older than both of them put together. The acting legend that he is, however, means the very chance of sharing screen space is a privilege for the heroines. Poor Sonam. At 25, she has to play 44-year-old Bobby Deol's wife (as if the age was the painful part of that proposition) and then pretend to romance 43-year-old Akshay Kumar. Neither of the two scenarios, however, are as lethal as having to act in an Anees Bazmee film, and Thank You relies only on Kumar, using everyone else as background. 42-year-old Ajay Devgn plays a divorced bank manager who falls for an intern at his bank, played by Shazahn Padamsee, 23. The actors are cast right according to their characters, but Devgn looks completely ill at ease with a girl that young, while Padamsee seems too awed by her superstar co-star to even try and act. At 25, Asin Thottumkal is a couple of decades younger than her co-star, but mere logistics have never gotten in the way of Salman Khan as he struts self-importantly across the screen. Salman's filmography balances out the inexplicable successes with the obvious failures, and this Vipul Shah dud definitely belonged in the latter pile. Salman and Asin will return on screen with Ready, slated for release in June. Asin's first Hindi film role was in Ghajini, a remake of her 2005 Tamil breakthrough hit of the same name. And while her hero Surya was 10 years older, Aamir here was 20 years older a realisation which perhaps urged our perfectionist to beef up like never before. Either way, Asin's second Ghajini was a massive blockbuster. Tabu was 37 when Cheeni Kum released, less than half the age of her legendary co-star, then 65. R Balki's film addressed the age-issue delicately and beautifully, however, and Tabu, a powerful actress, made sure her character stood up to Bachchan's feistily enough to create actual, wonderful chemistry between the two. If you thought the 38 year age gap was a big one, think again. Ram Gopal Varma challenged Bachchan, then 65, to fall lecherously for the legs of 19-year-old Jiah Khan in his Nishabd. Bachchan did a powerful job, while Khan, cast apparently because of how spectacular her legs looked in hotpants, was right for the job. Yet the film, while trying hard, didn't quite make it to the ambitious finish line it longed for. Anil Kapoor, now 51, starred alongside Sameera Reddy, now 29, in Abbas-Mastan's twisty crime thriller Race. The eternally fresh-faced Kapoor, however, was in the shape of his life, and not just did he look fine next to Sameera, but also fitter than co-stars Akshaye Khanna and Saif Ali Khan, both significantly younger than the Ram Lakhan superstar. Victor Banerjee, now 65, starred opposite Perizaad Zorabian, now 37 in a film about a May-December romance. Anant Balani's Jogger's Park was about a judge, struggling with retirement, who meets a bright young party planner while on an evening jog. The actors looked great together and the film, sensitively handled for the most part, was a resounding success. Meet Ajay Devgn, the realtor! What is the secret of Kangna's youthfulness?